Save the date: February 27th for a special sale ! Important -> I have some great news to share with you: this awesome heart shirt that usually retails for $24.99 will be only $9.99 on 27th February only ! Moreover, with the following coupon: 10offheartshirt you will save another 10% to buy the shirt, but this will only happen on February, 27th ! 300 pieces only are available at $9.99 that day. Once sold out, it will recover to $24.99. For this heart shirt, it is the lowest price ever. :) Why not taking advantage of this great offer ?. I have commented on Romwe product page. Yes I have commented and liked you fb page. Awesome give away loving that shirt! My raffle copter: TheBouncingBrunette@gmail.com, name is Angela. I left a comment :D And did some other stuff! Haha! I've commented on the product's page as well. Bel giveaway Vale, buona serata!!! I commented on Romwe's site about the shirt. My name Christy Peeples DuBois and email is reidsrd@hotmail.com. Done! 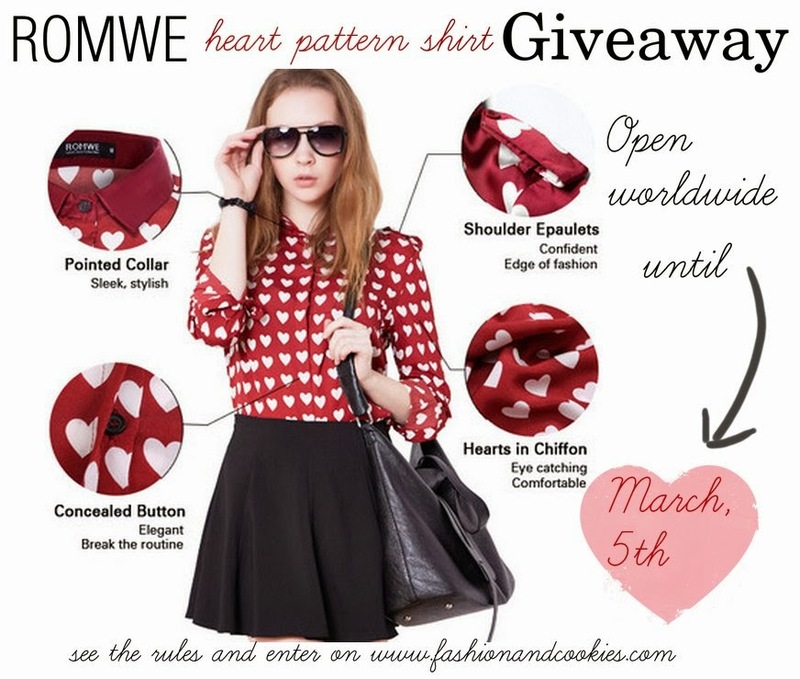 Thanks for the chance to win this fab shirt! Rafflecoptor & Bloglovin' "Kat E."
I commented on the Romwe Facebook page! thanks for your giveaways and that u include everyone no matter what despite they may be having a giveaway account blog or not . that doesn't matter and it annoys me when bloggers ban those who are a part of it . people are people and should be included . Commented on Romwe product page. I commented on Romwe as Denisa Ivascu. I commented under the name Casie Kersey! i commented on the romwe page. Yes I commented on the Romwe page :) Thought the shirt was pretty cute!